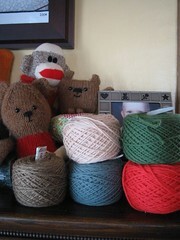 The yarn was all purchased at Knitch, the coolest, hippest, and all-around most friendly yarn store in Atlanta! I'm so glad Schecky is better. His sweet little blue eyes are so cute peeking out in this picture. glad to her scheck is better. you certainly sound chipper with all that sleep you got. Glad the boy is better! Never had that croup stuff around here - it scares me!! I'm so glad to hear about Schecky. There's nothing worse than having a sick kiddo. Those are so sweet. What fun knitting that must be! Glad to here your son is feeling better. Steriods rock!